"Not only was he one of us, someone we could be proud of, but he validated that this was the land of opportunity." When one thinks of baseball's legendary hitters, the names of Joe Dimaggio, Mickey Mantle, Hank Aaron, Ted Williams, and many others often come to mind. Usually forgotten among the list is Hank Greenberg�a hard-working, giant of a man who lead the Detroit Tigers to amazing success during the 1930s and 1940s. His statistics are excellent, especially considering his four-year hiatus to serve in World War II. In the summer of 1938, Greenberg embarked on a hardly mentioned quest to break Babe Ruth's monumental record of 60 home runs in a season. He fell just two round-trippers short of the mark, but still finished with incredible statistics. While his numbers are remarkable, the most intriguing aspect of Greenberg's life concerns his identity as a Jewish hero. Every base hit represented a victory in the minds of Jews across America. The Live and Times of Hank Greenberg takes an intimate, fascinating look at this compelling figure who rose to baseball stardom. Director Aviva Kempner (Partisans of Vilna) spent 13 years putting together this documentary, which paints a comprehensive picture of Greenberg's life and the society of the time. Composed almost entirely of historical footage and interviews, it avoids the conventional route of choosing a famous narrator to tell the story. Instead, Kempner incorporates a wide array of interviews with Greenberg, his family, teammates, and fans from all walks of life. This helps to truly show the powerful effect he had on his numerous devout fans. Jewish speakers ranging from actor Walter Matthau to lawyer Alan Dershowitz offer anecdotes and describe Greenberg's importance in their life. The personal feeling is refreshing and draws us much closer to the material conveyed. The major highlight of this feature is the chance to view footage from several interviews with Greenberg during his final years of life. When speaking about playing ball, his eyes light up like a small boy with a fiery passion for the game. Greenberg possesses an affable personality and offers few complaints about the immense difficulties of being a Jew in the major leagues. I found it especially interesting when he adamantly discounted the popular theory that pitchers pitched around him in 1938 because of his Jewish faith. The stories about Greenberg's abuse from fans and other players are extremely troubling and eye-opening to the social mores of the time. The legendary New York Yankees would actually call up nasty players from the minors to badger Greenberg while he batted. They never entered the game and stayed on the bench for just one rude purpose. Even at the home stadium in Detroit, fans yelled racist slurs when he struck out or made an error. Many players would have given up under the pressure, but Greenberg continued to compete and display his remarkable inner fortitude. Standing at six-feet, four-inches tall, Greenberg towered over most players and helped to debunk the prevailing idea of the typical Jewish man. Although he never considering himself a extremely religious person, he realized his importance to his fellow Jews. This documentary features numerous priceless stories about Greenberg's influence on everyday life. During the solemn services at the synagogue, they would stop the service to find out what he was doing on the field that day. When Greenberg refused to play on Yom Kippur during a pennant race, young fans identified with the hero who would not hide his religious background. The interviews concerning this event nicely convey its importance to their individual self-esteem. Although its main focus is the title player, The Life and Times of Hank Greenberg also reveals compelling insights about this turbulent time period. I found it amazing to discover that Nazi rallies in the United States took place throughout the country at such major sites as Madison Square Garden. Similar to Greenberg's abuse on the field because of his ethnicity, this is an item that is omitted to avoid embarrassment when teaching history today. However, it remains an essential part of the background of America at that time. There's also a wealth of baseball footage included that helps to capture the atmosphere of the game in the 1930s and 1940s. Today, the sport still has immense popularity, but it lacks the frenzied dedication that existed during that era. This documentary takes us back to this time through the extraordinary story of a forgotten hero. Image Transfer Review: Documentaries of this nature are difficult to review in terms of picture quality due to the variety of interview sources included from past years. Much of the material on this full-frame transfer stems from historical baseball clips and conversations from many years ago. The picture often contains glitches and defects that are understandable given the time period. This is especially evident in the Hank Greenberg interviews, which come from the early 1980s, when color quality did not match today's technology. Overall, this presentation does its best to offer a clear picture, and the result is an acceptable transfer. 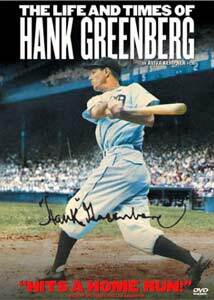 Audio Transfer Review: The Life and Times of Hank Greenberg is composed almost entirely of interview clips from an array of audio sources. This 2.0-channel Dolby Surround transfer presents them in fine fashion and provides impressive clarity. The conversations are understandable and contain a minimum amount of defects. However, the complexity level of this track is pretty light, and it fails to move to the highest level. It does offer enough power for this type of film, which does not require a 5.1-channel Dolby Digital transfer to succeed. Extras Review: Aviva Kempner grew up in Detroit and heard many stories about Hank Greenberg from her family. Her feature-length commentary highlights a nice selection of supplements on this disc. Kempner speaks constantly throughout the feature and provides an interesting background to the events occurring on the screen. After Greenberg died, she decided to do the film and worked dilligently for years on this project. Her words elaborate on the scenes being shown and concern her main goals for this documentary. This disc also contains several pages of text notes from Kempner that briefly describes the origins and concepts for the film. The other major inclusion is a collection of 25 minutes of additional interviews that failed to make the final cut. Although the quality is slightly worse in terms of visuals, they provide plenty of interesting material. There are more comments from son Stephen Greenberg, pitcher Hal Newhouser, Alan Dershowitz, and others. The information presented could easily have been in the film, but time constraints forced some deletions. The highlight of this section is the story about Greenberg's connection and help for African-American players. It really shows his personal spirit and heroic actions that made him well-respected. The remaining supplements include several glowing film reviews, bios for Greenberg and Kempner, Greenberg's statistics, and the full-frame theatrical trailer. It's rare to see critical comments included on DVD releases, but these full-length pieces from the San Francisco Chronicle, USA Today, Entertainment Weekly, and others provide an overall perspective on the power of this film. Greenberg's biography is especially well-done and gives an impressive overview of his story. When Jackie Robinson broke the color barrier and entered the major leagues, many players and fans ridiculed him and made his life miserable. One man who connected with Robinson and understood his situation was Hank Greenberg. His story comes across wonderfully in The Life and Times of Hank Greenberg, which stands as a treat for both baseball junkies and non-fans interested in our country's history. Aviva Kempner deserves tremendous credit for bringing this remarkable story to life. I give this DVD my highest recommendation.